US firms showed a huge appetite for Sirane’s innovative packaging solutions at the recent PMA Fresh Summit trade show held in Anaheim, California. Shelf-life extending bags and films, cooking bags and absorbent pads all proved to be a huge draw, as potential clients flocked from all across the continent. The staggering response reinforced Sirane’s belief that the North America market is ready for the level of innovation and expertise that the company can offer. Simon Balderson, managing director, said: “The response to our Sira-Flex Resolve shelf-life bags was overwhelming. There is simple nothing like it currently on the market. “A lot of fresh produce is travelling large distances, not only within the US but also from South and Central America, so shelf-life is a massive issue. Cooking bags – still a very new concept in the States – also proved a big attraction. Sirane's stand itself attracted a lot of attention - with the focal point two giant flags, the Union Flag and the Stars & Stripes, created entirely from fruit and vegetables. The flags featured plenty of fresh produce, including a lot of berries - and more than 1,000 blueberries. Berries proved a popular fruit at the show. Fruit pads – particularly for the huge American berry market – attracted a lot of potential interest. “The pads used widely in the United States don’t extend shelf-life, absorb ethylene or come with anti-fungal options – so there’s a real thirst in the US for this type of technology. “As a result of PMA we’re going to be pretty busy,” added Jeremy. PMA Fresh Summit was held at the Anaheim Convention Center, with a record 21,000 people passing through the show. Next year it will be held in New Orleans. Sirane will be flying the flag for the UK at PMA’s Fresh Summit in Anaheim – the largest fresh produce show in North America – as the country’s only exhibitor. A four-man delegation will head for PMA’s Fresh Summit in Anaheim in October as the company bids to introduce its products to the fresh produce market. Sirane can be found at stand 570 - but visitors shouldn’t struggle to find us – as an image of two giant flags created entirely using fruit and vegetables forms the focal point. The Union Flag and the Stars and Stripes took 18 hours to make and used more than 1,000 blueberries – each of which had to be washed and polished by hand. Jeremy Haydn-Davies, sales director, said: “The Union Flag has been everywhere this summer, especially during London 2012, so we thought why not create a fruit version? "But that would have left our American friends out, so we decided to get the Stars and Stripes as well. The stars apparently proved a bit of a challenge, but eventually a species of cauliflower was found where the florets will naturally form a star-like shape. Sirane is the leading packaging development-to-manufacture company in Europe, with a high level of expertise in areas including shelf-life and absorbency. Jeremy Haydn-Davies, sales director, said: “Our products have been selling well across the globe, but we are still relatively unknown in the United States. “However, no-one in North America is doing the kind of innovative packaging that we are making, so we think there is a big gap in the market. We expect significant interest. Products including fruit pads offering ethylene absorbency and anti-fungal properties will be shown at the expo – the Dri-FreshTM range is aimed at allowing the fruit or vegetables to stay in the best possible condition for the longest possible time. Also on show will be Sira-FlexTM Resolve® - a film with incredible shelf-life extending properties which has caused a bit of a global stir. The film, also available in a bag format, has been shown to add five days or more additional shelf-life to some fresh produce. Sira-FlexTM Resolve® is made from a natural bio-polymer – so is fully bio-degradable. The film’s astonishing qualities mean it self-regulates the conditions inside the pack. The perfect atmosphere is maintained inside the pack even if the storage temperature is variable. The film could lead to far less food being thrown away by customers and retailers. MD Simon Balderson said: “Shelf-life extension is the holy grail for the fruit and vegetable industry. A huge amount of food is wasted because it goes off before it is eaten. Mr Balderson said the new technology has broken new ground – food will not dry out, there will be no ‘fogging’ within the pack, and no mould or bacteria growth. 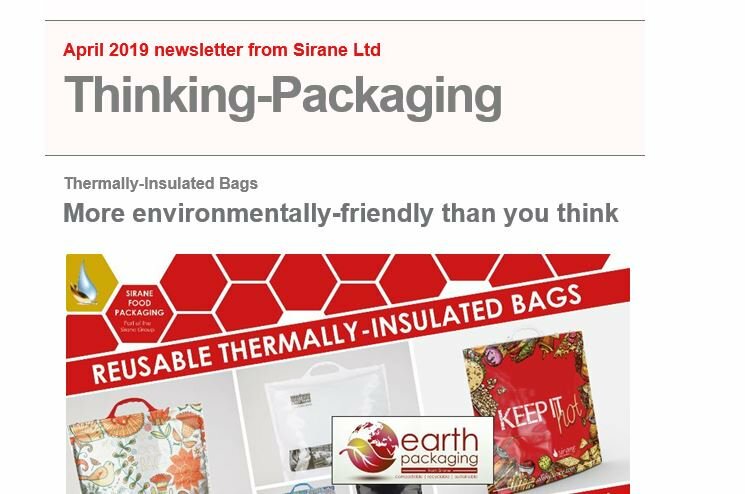 Sirane also produces a range of cooking bags, which are perfect for cooking vegetables or fruit-based desserts in a conventional oven or a microwave. These bags include Sira-CookTM Self-SealTM, Smart-Release and the Si-bagTM. Jeremy Haydn-Davies, director of sales for food packaging, said: “We’re finding interest growing in cooking bags. The bags are great products, which have so many uses - straight-to oven or microwave food doesn’t have to sacrifice on flavours. Fresh Summit is held in Anaheim from October 26th to 28th. Email jeremy@sirane.com or call +44 1952 230055 if you would like to make an appointment.